I had no idea we actually had this many pairs (19). I think they’re making babies in the closet. Have you found yourself with gear that seems to multiply on it’s own? I only have one pair!! No really, that’s just amazing!! I think I have 4 pairs (2 summer and 2 winter), but only use 2, one summer and one winter. Soon one of the fairly new summer pairs is going to a newer riders home as she needs a good pair and the Rev’its will suit her fine. Hard to get rid of them if they fit well and you like them though. For the love of gloves..
I’m thrifty, but find I need a minimum of five pairs in varying weight to cover from hot Summer to frigid Winter. With three people you’re averaging six pairs per person. Not unreasonable. Got any Held gloves in there? If not, you’re missing out. I have never tried Held, myself but my daughter just got a pair this past weekend. Wow! Have to admit, I’ve only been biking 6 months, but already onto my third pair. Essentially going for warmer and warmer pairs to see me through the winter. Finally settled on some Gerbing’s heated gloves. Three cold weather pairs and two warm weather pairs. My most recent are some really awesome kangaroo leather ones with kevlar stitching and sting ray as protection. I have access to a lot less motorcycle goodies since the ex and I split last year. 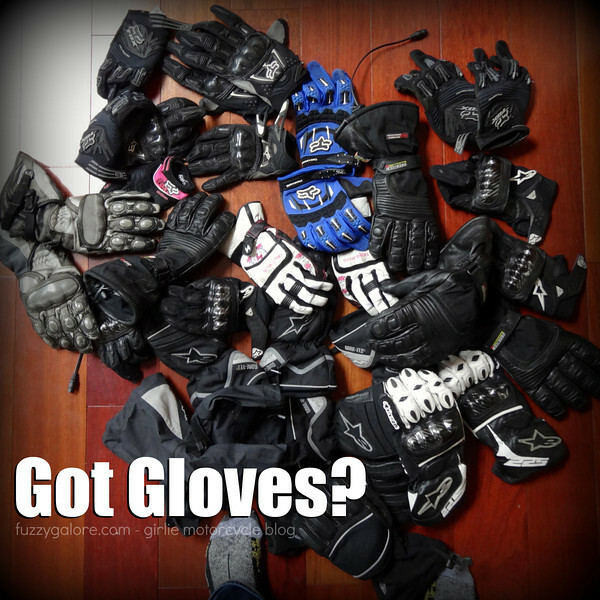 Short an awesome riding partner too… But at least I’m set for gloves!